Portland’s Red Electrics began their run on January 17, 1914. The interurban trains belonged to the Portland, Eugene and Eastern Railway and were painted red, hence the name. The all-steel railroad was one of the largest 1500 volt systems in the country. Much of the rails the passenger carrying Red Electrics rode upon had previously been used by Southern Pacific‘s steam powered freight and passenger trains. The system connected cities and towns throughout the Willamette Valley: Portland, Beaverton, Hillsboro, Carlton, Forest Grove, Saint Joseph (near McMinnville), Oswego, Sherwood, Newberg, Lafayette, and Corvallis. 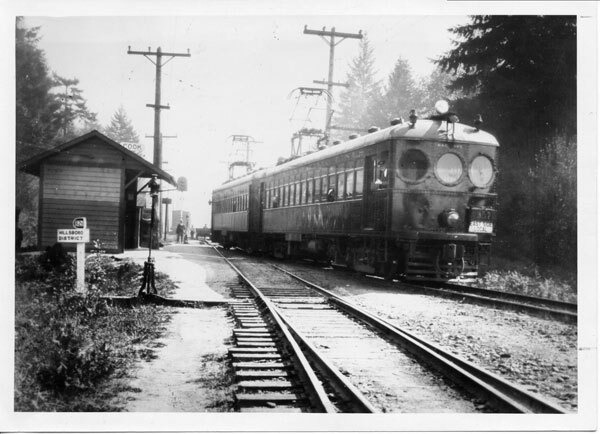 (Visit The Red Electrics page at PDXHistory.com for more details, including a service map, train schedule, and historical photographs!). With the rise in popularity of the personal automobile and other factors, the trains stopped running by 1930.